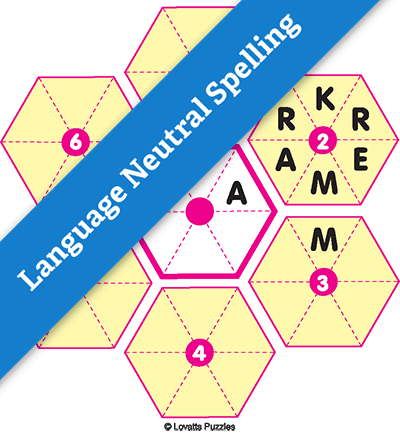 Colour puzzle with Language Neutral words – solve the clues and fill in the words into the right hexagon to work out the word in the centre one. There are six hexagons surrounding a central one. Clues are given for each of the six numbered outer hexagons. Fill in the answers clockwise in the correct hexagon. A word may start at any point in the hexagon but where hexagons touch, they have the same letter. You may convert the eps files to greyscale as colour is not essential to solve the Hexagon Word. Portrait layout. Colour (not essential). Solve the clues making sure that, where the hexagons touch, they have the same letter. Language Neutral spelling.